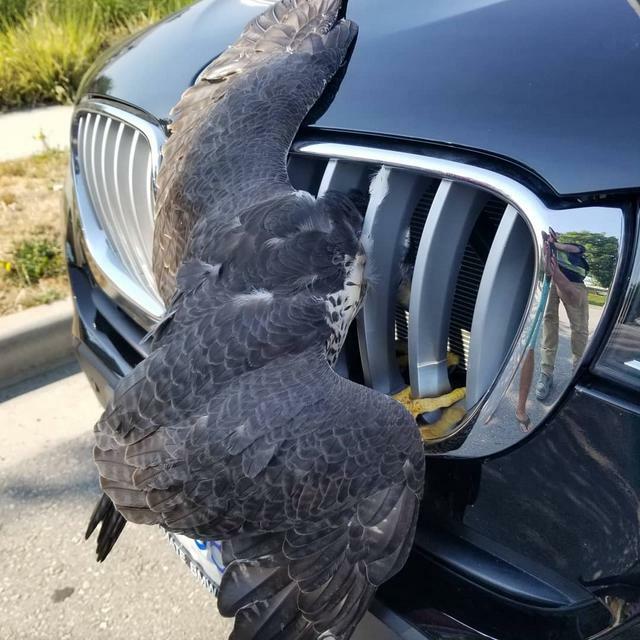 So I saw a woman driving with a Falcon stuck in her grill today. I ran out on to the street and flagged her down. I noticed pretty quickly that the falcon was still alive and not very happy. My favorite comment: "Great stuff! The tag on his leg explains his dismay at getting caught by humans twice!" A US Grammy nominee, now living in Chesterfield, has been given a suspended sentence after admitting to being illegally in possession of a protected bird of prey. Mary 'Holly' Holladay Lamar, 51, of Ashover Road, Old Tupton, pleaded guilty at Chesterfield magistrates' court on Friday to being in possession of a wild peregrine falcon and an unregistered peregrine falcon, Derbyshire Constabulary's wildlife crime team said. When a warrant was carried out at Lamar's home address on December 7, 2017, the peregrine falcon was wearing an identification tag of an older bird to make it look like it was bred in captivity. The older bird was found dead and half-eaten in a freezer at Lamar's home with its leg cut off. The young peregrine falcon is said to be 'doing well' now but will not be released back into the wild. A solicitor for Lamar told the court that she had only been looking after it and that she intends to go back to the US soon, according to the BBC. It is not known how Lamar, who is believed to have lived in Old Tupton for more than two years, acquired the bird. On Facebook, Derbyshire Constabulary Wildlife Officer said: "This is a fantastic result for this case and if she had not pleaded guilty today the judge stated that she would have been sentenced to custody. "The sentence passed in this case shows how serious the courts are taking offences against our wildlife." Lamar was sentenced to 18 weeks in custody, suspended for 12 months. She was ordered to carry out 120 hours of unpaid work, costs of £1,020 and a surcharge of £115. The American singer-songwriter is also now banned from owning or being in possession of any peregrine falcons and others birds for five years under the Wildlife and Countryside Act. Lamar co-wrote Breathe with singer Faith Hill, which was shortlisted for a Grammy in 2000 for best country song and song of the year. Aurora, a 22-year-old gyrfalcon who is the academy’s official mascot, and Oblio, a Peregrine falcon about seven years younger, were taken by two West Point cadets. "....By the way, Army beat the Air Force 17 to 14 on Saturday." But thank goodness---falcon is expected to fully recover. USMA has apologized. Fun article. Sounds like a destination for great migration watches. Thanks bonbon! We are so lucky to have birds in our lives to enjoy! Great article. Interesting comments too. Thanks DEF.